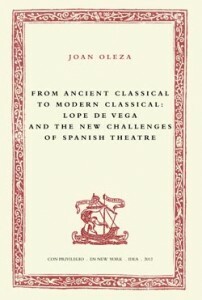 Joan Oleza, From Ancient Classical to Modern Classical: Lope de Vega and the New Challenges of Spanish Theatre, New York, IDEA, 2012. 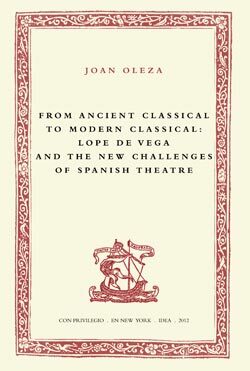 This book offers the reader for the first time in English some of Joan Oleza’s most representative essays on early modern Spanish theatre. Its pages go through the genre system that Lope de Vega puts into play and its evolution over time.They stop especially on one of the most innovative genres, the historical drama of private events. Or they go into the relativistic discourse that supports Lope de Vega’s theatre, such as Montaigne’s essays, as opposed to the theocentric and substantial thought of the time. Finally, it analyzes Lope de Vega’s entire theatre as a system in which three different factors interact: genres, schemes and cases. All these essays highlight the new challenges faced by the New Comedy. Joan Oleza is Professor at the University of Valencia. At present he is the Principal Investigator of different research projects as the Spanish classical theatrical patrimony: texts and research tools,TC/12 (http://www.tc12.es), or the Database, plots and texts of Spanish classical theatre project (Artelope,http://artelope.uv.es). His books include monographs such as La novela del XIX, or Trazas y bazas de la Modernidad; the coordination of collective books such as Teatro y prácticas escénicas, I and II; and edition of classics such asLa Regenta and Su único hijo, both of them by Leopoldo Alas, ‘Clarín’; Las paredes oyen. La verdad sospechosa by Juan Ruiz de Alarcón; or the Obras Completas by Guillén de Castro.